In order to achieve economic integration, policymakers are counting on regional economic communities (RECs) such as the West African Economic and Monetary Union (WAEMU) to be the main building blocks. One of the RECs that is often overlooked is the West African Economic and Monetary Union (WAEMU), which is both a currency union and a free-trade zone. The WAEMU is one of four existing currency unions in the world, the other three being the eurozone, the Eastern Caribbean Currency Union (ECCU), and the Central Africa Economic and Monetary Community (CEMAC). Created in January 1994, the WAEMU is composed of former French colonies (Benin, Burkina Faso, Côte d’Ivoire, Mali, Niger, Senegal, and Togo) and a former Portuguese colony (Guinea-Bissau) and is a stepping stone to further integration in West Africa. The eight WAEMU countries are also members of the Economic Community of West African States (ECOWAS), a group that also includes the six West African Monetary Zone (WAMZ) member countries (The Gambia, Ghana, Guinea, Nigeria, Sierra Leone, and Liberia) as well as Cabo Verde. In order to further promote regional integration in ECOWAS, countries are seeking to implement a common West African currency (the Eco) by 2020. The WAEMU has an institutional arrangement with France where the CFA franc is pegged to the euro (currently at a rate of CFA 655.957 per euro) and the French Treasury provides an unlimited convertibility guarantee. In exchange for this guarantee the central bank of the WAEMU, the Central Bank of West Africa States (BCEAO in the French acronym), is required to deposit part of its foreign exchange reserves in an account with the French Treasury (Compte d’Opérations). Currently, 50 percent of the BCEAO foreign exchange reserves are held in the Compte d’Opérations and are remunerated at the European Central Bank’s marginal lending facility rate. These peculiarities of the WAEMU raise a number of questions for Africa observers. 1. To what extent does the WAEMU encourage trade and financial integration? The literature on currency unions finds that belonging to a currency unions leads to increased trade levels with other members of the currency union (Frankel and Rose, 2000; Glick and Rose, 2001; Tsangarides, Ewenczyk, and Hulej, 2006). As portrayed in Figure 1, the WAEMU has typically had the largest level of intraregional exports in sub-Saharan Africa. However, since 2009, the share of intraregional exports in the Southern Africa Development Community (SADC) has surpassed that of the WAEMU. Still, the region continues to have relatively high and growing intraregional exports. When looking at overall trade (combining import and exports), the WAEMU has the second-highest level of intraregional regional trade, behind the SADC . Even though the WAEMU was only created in 1994, countries in the region have been sharing a common currency since 1945, when they were French colonies (this excludes Guinea-Bissau, which was a Portuguese colony). Sharing a common currency, a common central bank, a regional real time gross settlement (RTGS) system, and a regional automated clearing house (ACH) has led to reduced transactions costs, thus promoting intraregional trade. Additionally, in 1996, the WAEMU countries removed tariffs and quantitative restrictions on intraregional trade. Despite having some of the highest levels of intraregional trade in sub-Saharan Africa, intraregional trade in the WAEMU is relatively low when compared to customs unions around the world. While the Association of Southeast Asian Nations (ASEAN) and the EU’s intraregional trade amounts to around 25 percent and 60 percent of all their trade, respectively, that figure is estimated to lie below 15 percent for the WAEMU (Figure 2). Many non-tariff barriers also impede intraregional trade in the region. Such barriers include: costly border procedures, weak governance, inadequate transport infrastructure, poor business environments, and irregular implementation of WAEMU rules of origins—used to certify products as being of WAEMU origin and tariff-free—among others. 2. How do the WAEMU countries compare to other sub-Saharan African countries in terms of macroeconomic stability? Having a fixed exchange rate pegged has enhanced macroeconomic stability in the WAEMU. 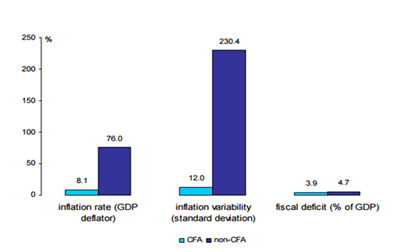 Indeed, the countries in the CFA franc zone outperformed fellow sub-Saharan African countries in terms of macroeconomic stability (Figure 3). Importantly, whereas some WAEMU countries suffer from political instability and weak governance, the CFA franc has historically provided a stable monetary institutional framework. Similarly, this steadiness was quite noticeable during the 2009 financial crisis where the peg served as a stabilizing factor. Recently, as several countries in sub-Saharan Africa with floating exchange rate regimes—notably Nigeria and South Africa—have seen their currencies depreciate in the face of a deteriorating external environment, the CFA peg to the euro has provided macroeconomic stability to the region. A legitimate question, however, is whether stability has not been achieved at the expense of a loss of competitiveness. 3. Has the WAEMU’s fixed exchange rate regime impeded competitiveness? As noted above, having a fixed exchange rate regime has truly benefited the WAEMU when it comes to achieving macroeconomic stability. Still, a well-known conclusion from the academic research on currency regimes is that competitiveness is more challenging to achieve with a fixed exchange rate regime compared to a flexible one. 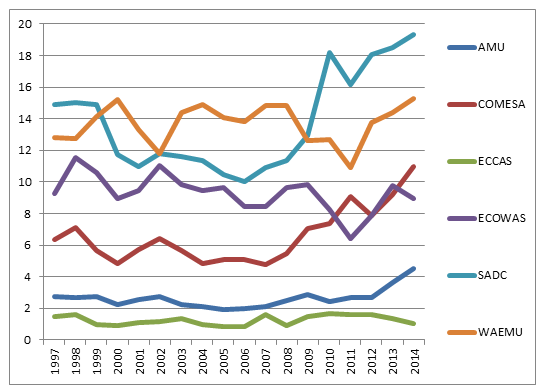 In spite of the 50 percent exchange rate devaluation in 1994, the WAEMU region is still relatively less competitive when compared to other regional economic communities in sub-Saharan Africa (Figure 4). Nevertheless, the lag in competitiveness witnessed in the region cannot solely be attributed to the fixed exchange rate regime. One explanation is that structural barriers in the region, such as a relatively poor institutional environment and underdeveloped infrastructure, have contributed to the inability of the region to attract capital and diversify the economies. 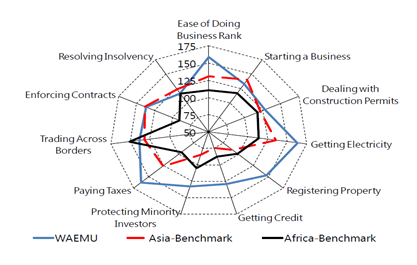 When assessing the ease of doing business, the WAEMU is performing relatively worse than the African region as a whole. 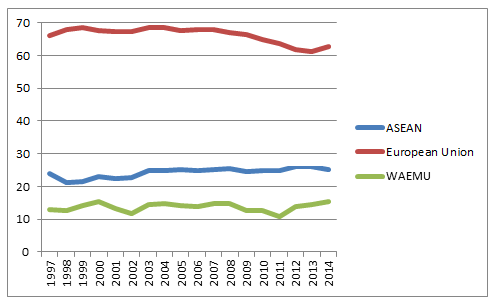 Figure 5, wherein the WAEMU countries tend to rank far lower than the Asian and African benchmarks, illustrates this trend. While the fixed exchange rate system has contributed to the lag, structural factors have taken a toll on competitiveness in the region. How has the WAEMU promoted economic convergence among member countries? Convergence— defined as the reduction of disparities in economic indicators, i.e., inflation, growth levels, and per capita income—is one of the key goals of currency unions. The idea is that, if achieved, convergence makes countries react in a similar way to common shocks, which makes a common macroeconomic policy to manage such shocks more effective for all countries. For example, in order to adopt the euro as their currency, EU member states are required to meet the “Maastricht criteria,” which requires economies to meet certain macroeconomic benchmarks relating to price stability, budget deficit, and debt-to-GDP ratio. Despite the adoption of convergence criteria in the WAEMU (which were revised in 2015 so as to be achieved by 2019), member countries have not converged towards similar growth levels. Rather, as portrayed in a 2013 study, two groups of convergence have emerged: one with Senegal and Côte d’Ivoire converging towards growth levels exceeding the union average and one with Guinea-Bissau, Niger, and Togo converging at an equilibrium lower than the WAEMU average. IMF estimates show that WAEMU countries will continue to face difficulties in meeting convergence criteria (Figure 1).The table shows the convergence criteria adopted by the WAEMU and the number of member countries that do not meet (or are projected not to meet) said criteria. For example, the table shows that none of the WAEMU member countries meets (or is projected to meet) the domestic revenue mobilization convergence criteria that states that the tax revenue/GDP ratio should be 20 percent at a minimum. The discussion has shown the potential benefits (macroeconomic stability, and increased trade and financial integration) and challenges (limited competitiveness) that WAEMU member countries face. The common currency is only one tool among many, and more needs to be done to reduce non-tariff barriers and comply with convergence criteria, especially on the fiscal front (not to mention that convergence criteria should be well calibrated). 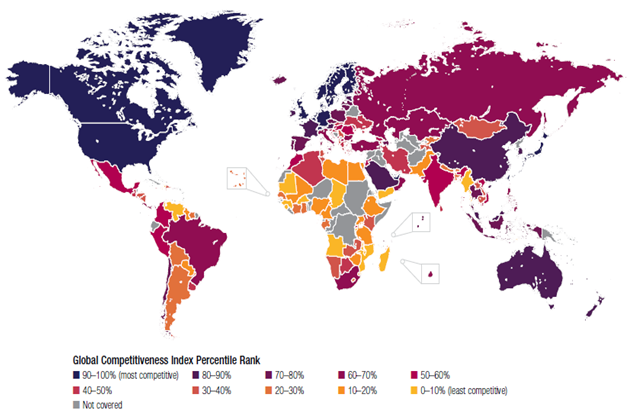 To increase competitiveness, countries will need to not only ensure macroeconomic stability but also improve the business climate, reduce the hard infrastructure gap, and invest in soft infrastructure such as skills and technology. Structural transformation is needed and the example of Côte d’Ivoire, which has increased agriculture yields above two tons per hectare, should be emulated. To do so, countries will need to invest in rural infrastructure and adopt policies to increase regional and global trade. Increasing farmers’ productivity will require strengthening training and extension programs. Structural transformation will also require industrialization policies to go beyond investment climate reforms and promote exports with both regional and global value chains, build capabilities of domestic firms, and foster industrial clusters. Last but not least, structural transformation will require a better understanding of the services sector and the factors that shape it. It will require leveraging the success in the ICT sector to increase productivity and access to finance. Finally, in preparation to the planned integration with the WAMZ—which includes Nigeria, a major oil-exporter—regional trade, financial ties and domestic macroeconomic frameworks will need to be strengthened.